Although Tuvia Ruebner—the 2007 winner of Israel’s Prime Minister’s Prize, 2008 winner of the Israel Prize, as well as Germany’s Konrad Adenauer Prize—is the author of 14 books of poetry in Hebrew (11 if we subtract two volumes of collected poems and an illustrated book of rhymes for children) and nine he translated into his native German spanning six decades, only a handful of his poems were available in English in anthologies and literary magazines prior to the 2014 joint publication by Hebrew Union College Press and University of Pittssburgh Press of In the Illuminated Dark, a bilingual edition of his selected poems translated by Rachel Tzvia Back (also reviewed in NYJB). Ruebner published his first two books of poems in Hebrew in 1957 and 1961 when he was in his thirties, and since then has published two books per decade. Although he won several prizes in Europe he was not so honored at home in Israel until 2007 when he was in his eighties. The predominant theme in Ruebner’s poetry is loss: loss of parents, grandparents and a sister in the Shoah, of his first wife to a traffic accident, and of his youngest son Moran who cut off contact with his parents during a trip overseas. While Ruebner was working with Ms. Back on that larger edition of his selected poems he was also guiding another team of translators who were working on this book under review. At just under 400 pages Ms. Back’s translation represents Ruebner’s entire six decade oeuvre. 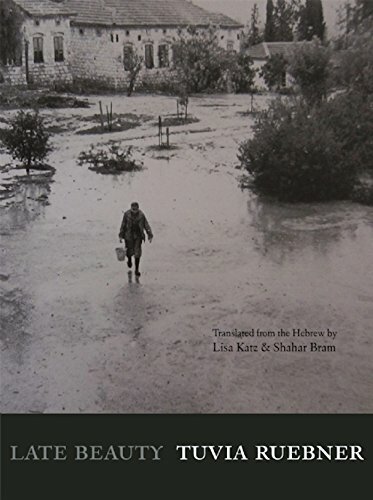 This selection translated by American-Israeli English language poet and Hebrew to English translator Lisa Katz and Israeli Hebrew language poet Shahar Bram, who usually translates from English to Hebrew, has a narrower focus on Ruebner’s postcard, ekphrastic, and autobiographical poems (though those categories overlap) spanning 45 years and culled from seven books of poems. Their collaboration began in 2009 when Bram asked Katz to translate the Ruebner poems Bram quoted in a scholarly book on the poet that was being translated into English. A year after In the Illuminated Dark was published in the U.S. Late Beauty was first published in England. After its 2017 American publication it was named a finalist for the National Jewish Book Award in poetry. Both translations add and subtract, but overall Katz and Bram tend to subtract more often than does Back. Their more streamlined versions have greater velocity, while the line breaks in Back’s versions are usually closer to those in Reubner’s original Hebrew than are Katz and Bram’s. This doesn’t mean that one translation is better than the other, just that they are different. In Ruebner’s Hebrew on the facing page in line five the noun translated as player is modified by the adjective “shachor” (black), which Katz and Bram have omitted. By congratulating himself on his lack of racial prejudice the poet belies his intention, an unforced error his translators correct. Apart from that it’s a terrific sports poem reminiscent of the sports themed poems of the late American poet William Matthews. Ruebner’s five Hebrew words in line 11 of “Postcard from Vienna” that Back renders as “An indistinct hum emanates from the steady traffic” Katz and Bram reduce to “the traffic hums.” The Hebrew words Back translates as “indistinct,” “emanates from,” and “steady” are dropped by Katz and Bram. In the Back edition Reubner replaces the word “korban” (victim/sacrifice) that appears in the Hebrew of the Kazt and Bram edition with “m’ratze’ach” (murderer, which is how Back renders it). This suggests that Ruebner changed the version of the poem he gave Back to translate following an earlier correspondence with Katz and Bram, despite the Back edition’s earlier publication date. “It isn’t necessary to clean sidewalks with toothbrushes./Yet Vienna is beautiful, a spotlessly clean city/with a rich past.” (Katz and Bram) In her endnote to this poem Back cites Reubner’s memoir “that Vienna . . . was the first city where Jews were forced to scrub the pavements with toothbrushes. It was there, he writes, where Jews encountered humiliations greater than in any German city.” Reubner has said that he differs from other Israeli poets of his generation in that he views things through the prism of Auschwitz while their prism is the nation state that arose from its ashes. Most of Reubner’s poems are in unrhymed free verse, but “Two Zen Pictures” and “Four Japanese Woodcuts: Old Age” employ syllabics, and “With a Blue Headband” and “Black Watercolors” are in regular metrical stanzas that rhyme in Hebrew but not in Katz and Bram’s English except for one instance each of internal rhyme in one and slant rhyme in the other. “A fragmented landscape, as if sewn from rags. In a voice-not-a-voice the broken water recedes. The face of my sister flickers among the hills. “Mornings, day after day, like holes. Childhood days, their eyes stony. Don’t lift. The remaining poems are personal and autobiographical. Readers who devoured In the Illuminated Dark will welcome the additional poems in Late Beauty, and for readers unacquainted with Ruebner’s poetry Late Beauty provides a portal.